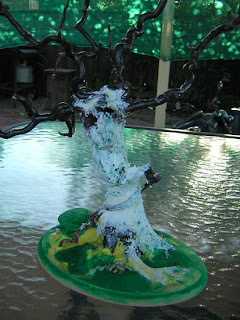 After this had dried I added the bark of the tree. The the whole thing was undercoated. The tree was sprayed white and then 'frosted' before the five little faeries could begin to take form. Some of the faeries will sit in more than one position in the tree. They looked like a little group of ballerinas until they had their hair on; then their little personalities really came out. All that remains now is a bit more drying time for the tree and then they will all be off to their new home. 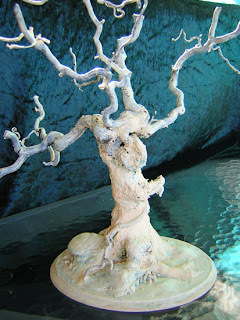 This is the tree after adding "Makins" air dry clay to form the trunk and the roots of the tree where it joins the base. I added to existing features on the branches as well. My name is Terry Thomas,I am an Australian polymer artist who creates sculptures based on the female form. My sculptures range between 1 inch and 26 inches (2.5cm to 75 cms) I welcome all enquiries. I sometimes list on eBay.